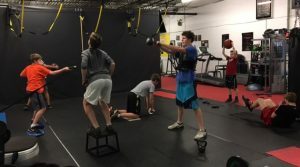 Tier 1 Athletic Performance – Why Tier 1? Every athlete will get a comprehensive program to fully develop his or her sport performance. Participants will work harder than they thought possible while practicing elite level nutrition with state of the art recovery techniques. Your athlete will be prepared to perform at his or her highest level from the beginning of the season forward. Full player development requires more than just lifting weights or running on treadmills. It is difficult to quantify improvement without baseline testing and final testing. TIER 1 tests every athlete prior to starting every program. Without specific nutrition requirements, players will not receive the full benefits of their hard work. TIER 1 provides individual diets for each sport and participant. Athletes will then work harder than they thought possible to achieve results. Pre-training physicals are also administered and Dr. Mark May is on premises to oversee the Training, Nutritional programs, the health and safety of every athlete.